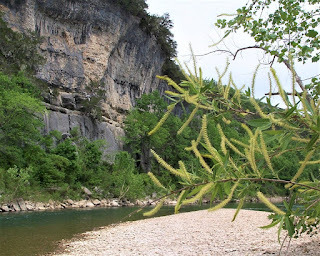 The beekeeping seasons change rapidly in the Mid-South, and the sight of black willow trees in bloom along sandbars of Arkansas’s Buffalo National River is a milestone in the beekeeper’s year. Willow trees bloom in Arkansas between February and April. Throughout March, the honey bees’ harshest month, beekeeping efforts are largely devoted to trying to keep colonies alive. Rapidly expanding colonies are eating the remainder of last fall’s stored honey. This honey consumption is largely occurring ahead of the spring nectar flow. If the beekeeper was too greedy in robbing the hives last year, starvation during March is likely. However, April sees a massive increase in available flowering plants, and many of these important bee plants are trees along waterways. Willow trees are an abundant source of both nectar and pollen, and they are highly attractive to honey bees. On warm spring days, large numbers of honey bees may be found foraging willow’s colorful yellow catkins. Increases in pollen being brought into the hive stimulate queens to increase egg laying. Honey bee colonies never turn away excess nectar being brought into the hive by foragers. As the honey bee foragers bring in greater amounts of nectar, many colonies experience brood nest congestion when the bees store nectar in the brood nest. If there are not enough empty honeycombs outside the brood nest to hold the nectar, the bees will place it in the cells needed for the queen’s egg laying. Brood nest congestion often leads to swarming. Mid-South beekeepers experience many occurrences of swarming in early April. Some see their own hives swarming. If the beekeeper is able to capture his or her own swarm, the bee yard merely receives an unscheduled colony division. Many beekeepers capture swarms to replace colonies lost over winter. In areas where Africanized honey bees are not present, swarms are welcomed as a source of honey bee genetic diversity. Willow honey is light in color and described as having a pleasant aromatic flavor.